Seven Times Salt will provide splendid live music for CDS-Boston’s Wednesday English Dance, this week celebrating with a post-NEFFA party at the Scout House. You’ll hear tunes popular from 1650 up to the present; some are elegant, some rowdy, some romantic, some playful. 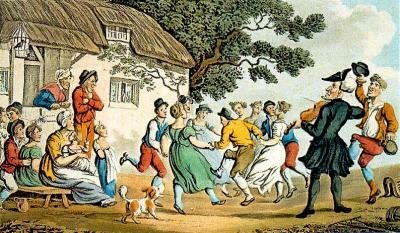 English Country Dance is social, community dancing. Friendly dance callers will teach all the dances; no experience is necessary. Dancers take a different partner for each dance of the evening, and join a “set” of couples. Each couple dances a series of figures with another couple, then repeats the same with each pair in the set. Come dance with us!